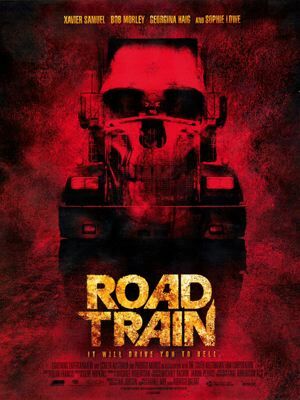 Road Train is an Australian horror film filmed in the Australian outback. The film is also known as Road Kill in the USA. The film was released in 2010. Be aware that my opinion on this film seems to be vastly different to the majority of other people! 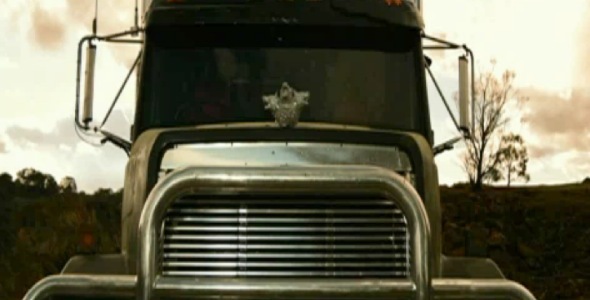 Road Train starts off very similar to other road trip horrors, most notably Wolf Creek. Four friends are on a trip across the Australian outback. Riding along one day they see a gigantic lorry in their rear view mirror; a road train. Road Trains are giant lorries that have multiple carriages. The road train crashes into the groups car causing it to barrel off the road. Stuck in the middle of nowhere the group see that the road truck has stopped down the road. They decide to confront the lorry driver about what he has done, as well as to get help off him. Arriving at the truck they find it deserted. Sudden gunfire heralds the arrival of a crazed gun man, in panic the quartet leap in the lorry and ride off, but it isn't long before a hypnotic radio signal knocks them all out. 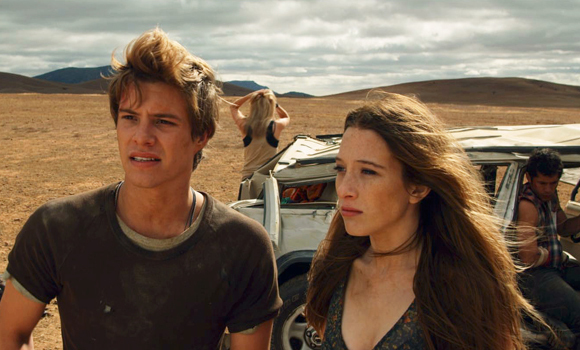 They awake to find themselves, and the truck in the middle of nowhere. Things start getting more and more bizarre. The foursome most unravel the secrets of the sinister lorry, and it's secret cargo. The first 15 minutes of this film feel near identical to Wolf Creek. The daytime location of the Australian outback gives a strong feel to it. When the lorry turns up everything changes. A friend said upon the appearance of the road train 'here comes the bad guy' I replied 'no, actually that's a lorry, I bet the bad guy is inside driving it', but I was proven wrong, the sinister road train seems to be a diabolical thing of evil, able to drive itself, and run on the blood of victims. Most of the film is set in and around the train. 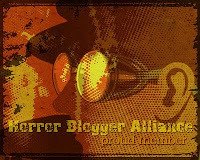 The characters get increasingly brainwashed by the evil, to varying degrees. It has the power to make people want to kill for it. It appears (via inserted images of red eyed dogs) that the train is the physical manifestation of Cerberus; the 3 headed dog guardian to Hell. Other than this nothing is explained, and that's where most the films faults come from. There is no explanation for the origins of the road train, or even what it really is. The train has 2 metal containers, one of these you never discover what is inside of. There are a lot of plot holes, and mistakes. There is a gun used at various points in the film that appears to have infinite bullets, the ending while obvious never really made any sense, characters manage to warp locations with no explanation, a key plot point of one of the characters seeking out a shack she saw makes no sense as she was unconscious at the time she was supposed to have seen it, and most bizarrely one character finishes his only bottle of water, immediately afterwards he urinates into the empty bottle and tries to drink that, then later throws the urine in someones face who reacts as if it were acid! The acting is also of an average standard, though I do love the Australian accent. The good points though; the film looks amazing, the natural beauty of the Australian outback brings both a sense of isolation, and wonder to the film. Some of the shots are amazing, one in particular sees a character standing in the centre of the screen with the vast outback stretching into the distance behind him. Quite well directed with good special effects. The films score is also of a mostly high quality, and really fits the tone of the film well, I loved the music used, apart from a bizarre super hero/descent into hell type music that occurs twice involving Craig newly possessed by the train. 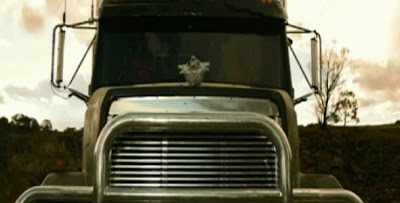 The plot is also quite unique, there have been other tales of demonic vehicles, but none quite like this one about a Demon lorry from Hell that runs on the blood of innocents! I really enjoyed the weirdness of this film, it never sticks completely to the conventions you expect, instead morphing constantly. It is certainly a low budget acquired taste, and not for those expecting a scary film, or a traditional one. I found it a lot of fun despite (or maybe due) to its many many flaws.